Finding difficulties in managing PDF? Searching for a solution to Split & Merge files effectively? To manage the PDF, go for Split & Merge tool which allows you to split PDF file into multiple parts according to its number of pages. You can also combine PDF files into a single file. With this option, users can split a single large sized file having multiple pages into separate files. The software saves the output PDF documents in a sequentially numbered way so that you can easily track your pages. Using this option you can create a separate file for all the pages in even number of count. For instance; if there are 12 pages in your file, then using this option will create a PDF document for pages numbered as 2, 4, 6, 8, 10, & 12. The software splits up odd numbered pages of the selected PDF. For example, if you are having a file with 12 pages then the software will cr ate a file each for pages numbered as 1, 3, 5, 7, 9, & 11. The software provides an option for those who want to split their file by range. Suppose, you have a 12 page file and only 5 pages from the middle are needed (2-7). Define a range for pages and the tool will ex ract pages that come within that range into different PDF. The software allows you merge “N” number of documents into a single one. You have the option to merge multiple PDF files into one document or you can add a folder of documents to create one single document of PDF. The source PDF files will remain unchanged from formatting. The software is compatible with all the versions of Windows Operating System. Moreover, the Split & Merge application is capable of running smoothly with any version of Adobe Acrobat PDF files and requires Adobe Reader installation in System. Install Demo version of Split & Merge software that allows the users to show the preview of the output files. Trial Version allows you to save the merged and split files but the output pages will have company's name watermarked over the pages. You can order for licensed version of the tool through the payment gateways. We ensure you a safe and secure way of online transaction. Order the full version of the product to completely enjoy the benefits. Yes, software is compatible with Windows 8.1, Windows 8, and below versions. What is the Advantage of using "Range" PDF Splitting Choice in the Tool? Add the PDF that you want to split, select the proper split options. You can select among several split options that are easy to understand and manage. For example, if you want to split your document into page ranges (e.g. 1-3, 5-12, etc), just select Split by range. 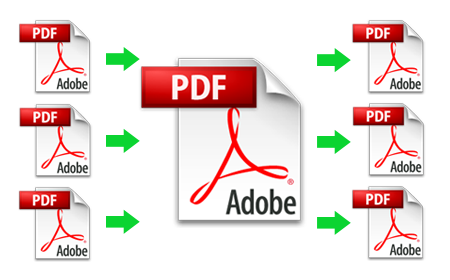 If you have number of PDF files, then you can also merge them all into a single PDF for easy management. Multiple files can be added one by one or a folder with multiple files can be selected for processing. The source PDF files will remain intact. Is there any limitation on number of PDF files that I can merge? No, there is no such limitation. You can combine any number of PDF files at once. "I really thank you for developing this tool. It's easy to use tool and I don't have to fear that I will lose the original PDF files as it does not bring any change in the original PDF files." "I wanted to split up a particular number of pages from my PDFs, but didn't think it would be possible with such an ease. When I found this tool, I was really happy. Using the split by range option I successfully got what I wanted without any difficulties." "A professional design and absolutely convenient to operate. It has better split & merge options. I downloaded the trial version and I was completely satisfied so I went for the licensed version." "PDF split and merge is brilliant. With this software, I had my PDF files split out in less time. It has a Simple interface and a wide range of options to split and merge the files effectively."